We can use SDCC - Small Device C Compiler for compiling C codes for 8051 and other 8051 compatible microcontrollers like DS89C430 and many more. The manufacturer provides a very good application note which focus on the use of SDCC to develop firmware for the DS89C430/450 family. We can copy the "sdcc_reg420.h" file from the same app note. Also, here is the user's guide and data sheet for the DS89C430/450 family. Also, we could install the SDCC by searching SDCC in the Synaptic Package Manager. Loading the hex file to the mcu could be done via a simple UART interface since the mcu have a built in ROM loader (a built in boot loader). This is the ISP programming (in circuit programming). Procedure is very simple, what we need to do is just to interface the serial port 0 of the mcu with a PC (via UART ie (RS232 + MAX232)). We need to invoke the rom loader mode for the ISP programming. The procedure is well explained in the user's guide (link provided at top). The ROM loader mode is invoked by simultaneously applying a logic 1 to the RST pin, a logic 0 to the EA pin, and driving the PSEN pin to a logic 0 level. If power were to cycle while the required input stimuli were present, the loader would be invoked on power-up. When the ROM loader mode is invoked, the device awaits an incoming <CR> character (0Dh) on serial port 0 at a baud rate that can be detected by the autobaud routine. begin execution at location 0000h. Note that both of these conditions must occur, or the loader is exited. We can use the DTR of the serial port to invoke the ROM loader mode . Below is the circuit diagram from the user's guide. 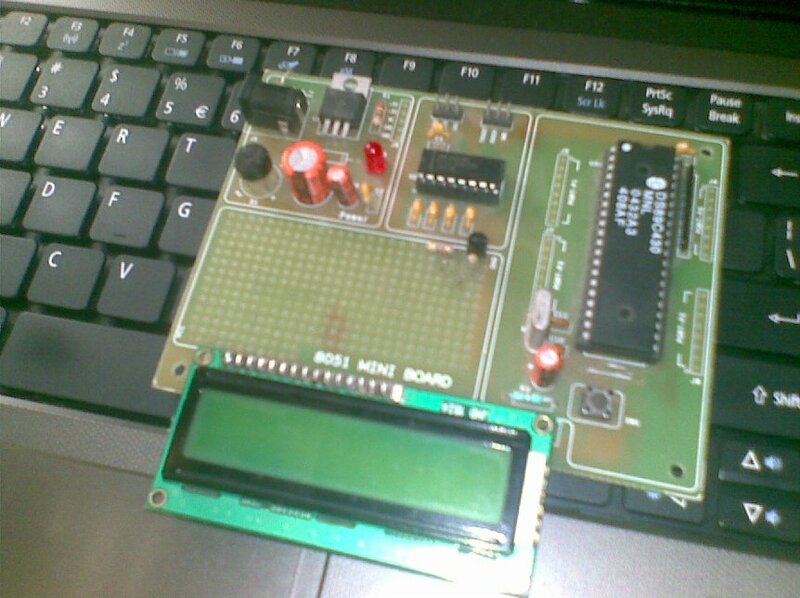 Now, we need to send some commands to the microcontroller for erasing flash, loading flash, reading memory etc. The list of commands are there in the user's guide. Just need to specify the *.ihx file name in command line argument. print "hex file not specified in command line argument\n\n"
print "example:\n python romloader.py ledblink.ihx\n\n"
print "CONNECTED TO LOADER SUCCESSFULLY"
print "cannot open serial port "
Save above python code as "romloader.py" and input the hex (ihx) file as command line argument.. Recently I came across STC12C5A60S2 (STC-51.com). That has the fast 1T operation too. I compared it with PIC18f452. At the same crystal frequency (I used 11.0592MHz), PIC could catch up with STC-51 when its internal clock multiplier (x4 PLL) was enabled. STC has a lot of built-in peripherals (such as ADC/SPI/UART/On chip EERPOM). I am impressed by this inexpensive chip, but not sure about its reliability. Since the manufacturer is based in China, the English documentation and technical support is almost non-existent. They do have an English manual which includes some sample codes. Wondering if people are using it for real world applications other than for hobby/toy purposes. Great Article Vinu. Worked well for me and had to do some very little changes according to my hardware setup. All th best!